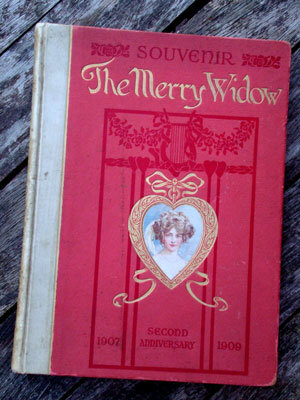 This website is very grateful to CM from Glasgow for sending us a copy of this wonderful souvenir from the second anniversary of The Merry Widow in 1909. This 87 page hardbound book contains the story of the play, in verse, by Adrian Ross and these delightful watercolours. Note that the title page says this is the first anniversary souvenir, so it would appear to be that volume, rebound, with the letter ‘to the Public’ from George Edwardes stuck in. To-day “The Merry Widow” celebrates her second birthday at this Theatre. Her sweet love-story, wedded to the music of Franz Lehar, has been received with acclamation throughout the world. On my part, no effort was spared to make the English production, in originality and invention, worthy of the traditions of Daly’s Theatre and pre-eminent among the productions of all nations. The magnificent generosity and consistency of your support has set the seal of success upon my efforts. I beg you to accept my most sincere and grateful thanks. Edwardes' letter, 8th June 1909. Titlepage from first anniversary edition. "The Women! How to win them."